For the first time ever Tencent’s 2018 Q3 earnings call let us know how much they earn from cloud services. It was certainly more than I or many others expected. 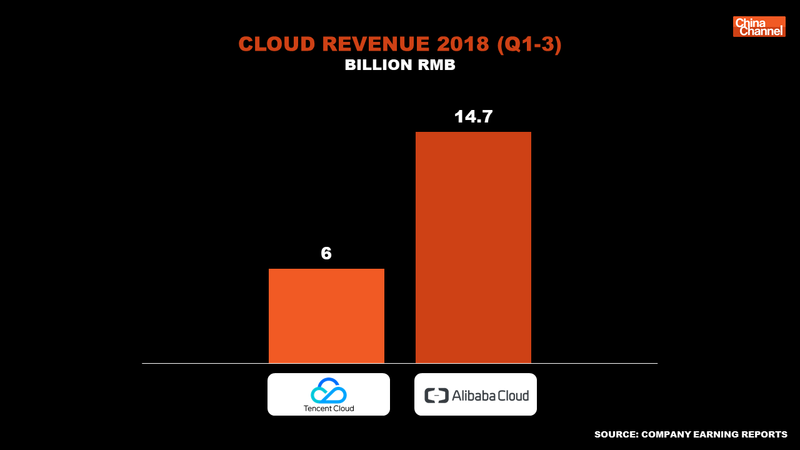 “2018 Q1-Q3 cloud services revenue was 6 billion+ RMB (0.86 billion USD) , more than doubling YoY. 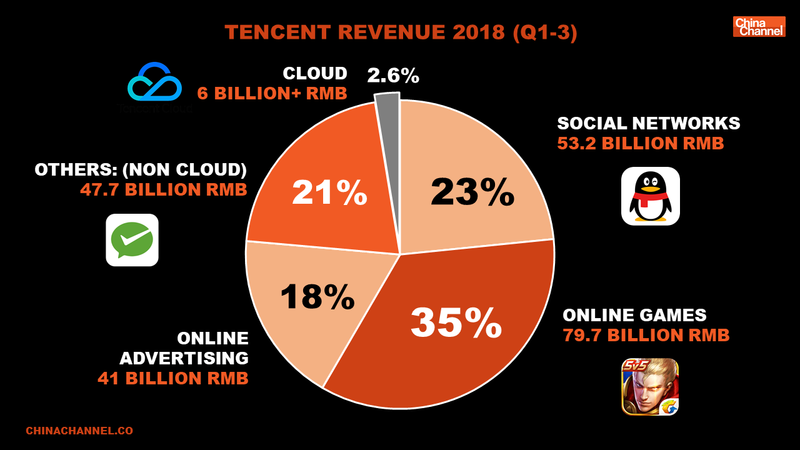 Paying customers grew at a triple-digit rate YoY.” That puts Tencent’s cloud revenue at about 2.6% of total revenues for 2018 so far. Nice to finally get a bit of clarity into how the mysterious ‘others’ revenue segment is broken down. We can also take this number and compare it to the China mainland market leader in cloud services Alibaba who have broken out Cloud services in their financials a while back, (something I believe Tencent will also eventually do albeit we might have to wait a couple of years). For Ali, cloud has earned them 14.7 billion RMB (2.1 billion USD) to date in 2018, so Tencent certainly isn’t as far behind as we feared with revenues at around 40% of Ali’s. Tencent claimed to offer more than 200+ cloud products and 70 industry solutions and also claimed leadership in cloud services for gaming and live broadcast. They noted making progress in the finance and retail sectors something that makes sense given the recent announcements of partnerships to provide digitalization services with brands such as Shangri-la hotels and Walmart. Opportunities will arise when we move from Iaas (infrastructure as a service) to Paas (platform as a service) and Saas (software as a service), then we can actually start generating high margin revenue. We can also have new value-added services built out from our connection with the industries. 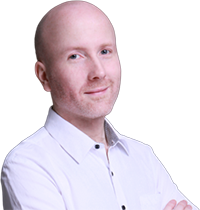 If we could establish a CRM or OEMs to reach customers then there will be associated marketing revenue and VAS. This last part makes a lot of sense. Tencent higher management have made it clear they are very willing to move into new areas where the business models aren’t initially clear. 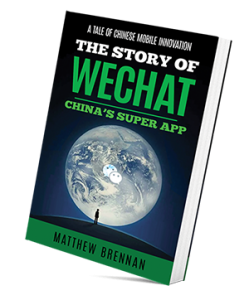 “Monetization can come in unexpected ways, we don’t know what innovations will happen in the future.” one Tencent exec described during a lecture I attended earlier this year. Perhaps that’s the luxury of working in the internet sector where marginal costs are almost zero, any kind of monetization across hundreds of millions of users can work out to be highly profitable. It also seems that Tencent is looking at this shift as something that will play out over a very long time horizon, perhaps a decade or more. I found it interesting that despite the narrative in media that Tencent is cost cutting, staff headcount increased by 8% in the last quarter, the fastest rate in 2 years. CFO John Lo attributed mainly to hiring for the areas of Payment and Cloud. So beyond the recent restructuring, Tencent is also rapidly increasing human resource capacity in “industrial internet” related areas.